The press release was posted on Nigerian Police Facebook page and Shared on Twitter handle as seen above. RE- PUBLIC PROTEST BY CONCERNED NIGERIANS “OUR-MUMU-DON-DO MOVEMENT” AT UNITY FOUNTAIN, ABUJA ON 8TH AUGUST, 2017. · Police dispersed unruly protesters and prevents breakdown of law and order and disturbance of public peace in the FCT. 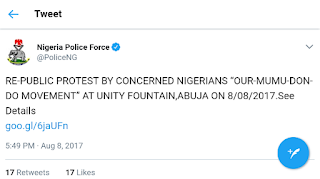 The FCT Police command in the early hours of today 8th August, 2017 intervened and prevented breakdown of law and order, and disturbance of public peace in the Federal Capital Territory (FCT), Abuja by dispersing some miscreants, hoodlums and other criminal elements that have infiltrated the protest being carried out by a group of concerned Nigerians under the auspices of Our-Mumu-Don-do Movement at Unity Fountain, Maitama, Abuja. 2. It will be recalled that “Our-Mumu-Don-do Movement” carried out their protest on Monday 7th August, 2017 at the same venue and were accorded necessary Police presence to safe guard public safety and public peace, and protect their rights to freedom of expression, rights to peaceful Assembly and Association, and right to freedom of movement as provided for in sections 39, 40, and 41 of the 1999 constitution as amended. 3. However, today 8th August, 2017 the same group assembled at the same venue but allowed miscreants, hoodlums and other unruly individuals to infiltrate the protests, who started blocking the major roads adjoining the Unity fountain, obstructing traffic and preventing movements of other innocent citizens from going to their means of livelihood, and thereby exhibiting unruly behaviours and other violent acts very likely to cause the breakdown of law and order and disturbance of public peace. The Police personnel intervened at the point that the concerned Nigerians Group lost control of the crowd and prevented miscreants, hoodlums and other criminal elements from hijacking the protest to cause mayhem and chaos. 4. It is pertinent to state here that the FCT Police command is fully aware and recognizes the constitutional rights of every citizen including “ Our Mumu Dondo group” to assemble and move freely in any part of the Federal Capital Territory, but the command will not allow any protest under any guise to turn violent and jeopardise the prevailing peace, law and order currently being enjoyed in the FCT. The command wishes to assure all residents and visitors to the territory of adequate security and protection of lives and property of everyone including those who choose to express their constitutional rights of protest with decorum. 5. Consequently, members of the public, parents and guardians, religious/opinion leaders and other interest groups are advised to prevail on their children and wards, followers and adherents not to allow themselves to be used by any group to cause disturbance of public peace and break down of law and order.